The United States Congress designated the Pine Mountain Wilderness (map) in 1972 and it now has a total of 20,053 acres. All of this wilderness is located in Arizona and is managed by the Forest Service. At 6,814 feet, Pine Mountain is the highest point on the Verde River Rim, which slashes across this area from northeast to southwest. On the mountain's southeastern side the unmistakable steep and rocky Skeleton Ridge falls toward the Verde River, a National Wild & Scenic River. On the rim you'll find an "island" of tall ponderosa pine and Douglas fir surrounded by desert mountains and hot dry mesas covered in pinion and juniper, cut by rugged canyons. 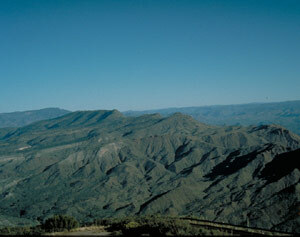 The rim overlooks the Verde River with fine views out across the desert. Despite scant water, wildlife abounds here on forested slopes and in the canyons, especially game animals. This area was first protected in the 1930s by the Forest Service the effects of over 80 years of protection are apparent to the careful observer. The processes of nature are unhindered here. Pine Mountain Wilderness straddles the boundary between Prescott and Tonto National Forests. Not far to the north lies Cedar Bench Wilderness. Backpackers will find plenty of solitude on the area's 37 miles of trails. Planning to Visit the Pine Mountain Wilderness? How to follow the seven standard Leave No Trace principles differs in different parts of the country (desert vs. Rocky Mountains). Click on any of the principles listed below to learn more about how they apply in the Pine Mountain Wilderness.